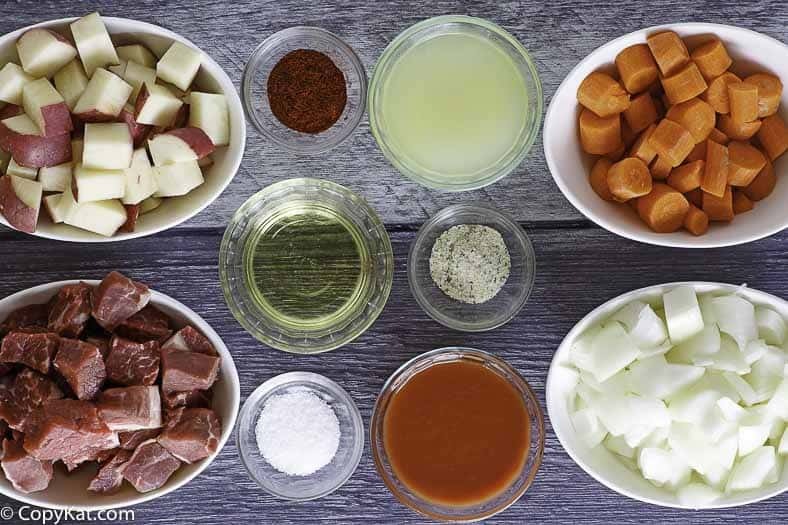 So you might be asking what is Instant Pot beef stew. The Instant Pot is a pot that functions as a slow cooker, a pressure cooker, a rice cooker, it makes congee and more, and how does it work? It works brilliantly. I was looking to replace my pressure cooker with something that could multi-task. I found it. No, this isn’t a paid endorsement. It is someone that is triumphal with the results. I have made several recipes this weekend with it, and I have been happy with all of them. If you know me, you know I can’t make rice on the stove top. I try, I fail. So the rice here is cooked very well, and it does so much more quickly than in my rice cooker. Tonight, I had to cook a roast. I often go grocery shopping before the weekend starts and Sunday night I am often cooking things for the week. This week it was stew. I made beef stew tonight that was excellent, and honestly some of the best that I have ever made. In about an hour I had beef that was so tender you could break it apart easily with a fork. Tonight’s inspiration was simplicity, and I wanted something to remind me of my Grandmother’s beef stew. She cooked plainly, letting food’s natural flavors come through. So tonight’s pressure cooked stew was beef, potatoes, onions, carrots, a little garlic powder, salt, tomato sauce, chicken broth, and smoked paprika, and that was all. What I ended up with was a savory stew that I will enjoy for this week. I did pressure cook my stew twice. The first time through it was simply salt, tomato sauce, and chicken broth. I wanted the meat to have a head start on the vegetables, so I put them in first. I cooked these for 15 minutes, and then I put in the veggies and cooked for 30 minutes. What I ended up with was a flavorful stew that you would have thought was on the stove top for an afternoon. What I like about using the Instant Pot it is that is a safe, easy way to pressure cook. 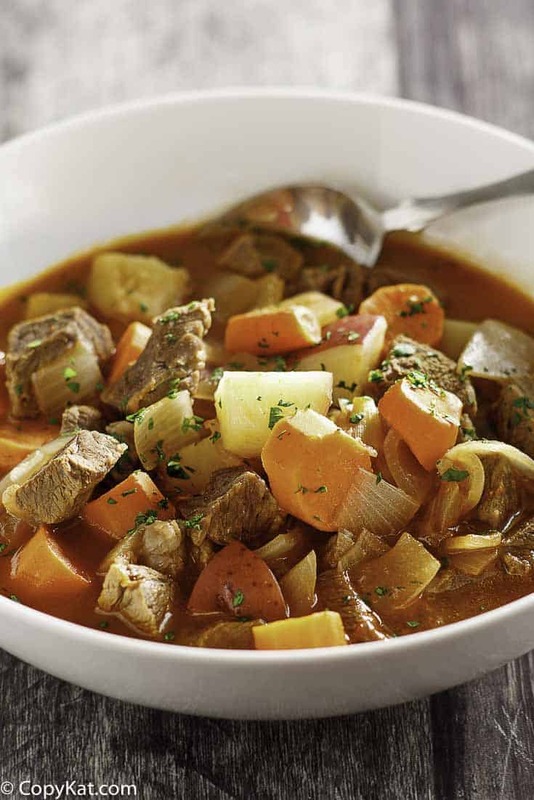 The flavors stay trapped within the liquid, so you get a nice flavorful stew. This stew cooks quickly, and the pressure cooker is relatively silent when in operation. It will even switch to a warm mode once the food is cooked. I browned my meat right in the pot, then put on the lid, set the timer and walked away until it beeped. Brilliant. This is the working person dream. Loved this recipe? Try my other Instant Pot recipes. If you are still wondering if you should get an Instant Pot you can read my blog post about Should You Get an Instant Pot? 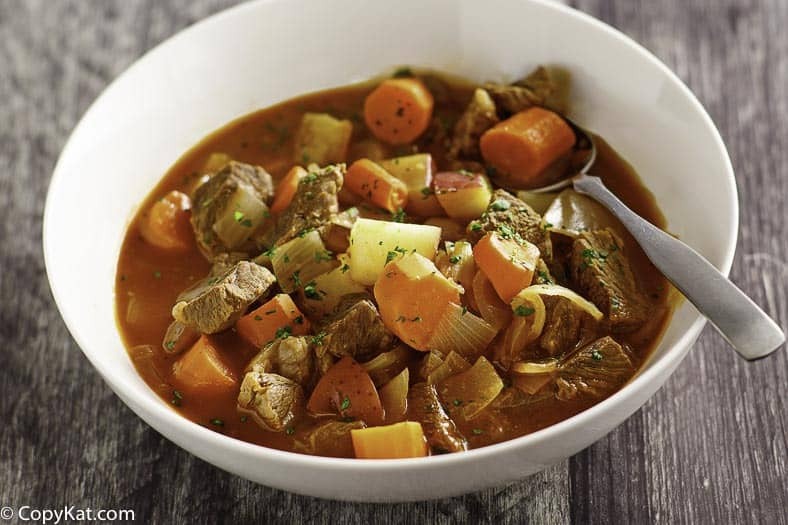 You can make the post amazing Instant Pot Beef Stew. Cut beef into bite-sized pieces. Season meat with salt. Brown bite-sized pieces of roast in the Instant Pot on saute in vegetable oil, you may need to do this in small batches. Once the meat has browned add tomato sauce and chicken stock. Cook the meat on the manual high setting for 30 minutes. Perform a quick release. Then add the garlic powder, smoked paprika, vegetables and cook on the manual setting for 4 minutes. When the stew finishes you can either perform a quick release or a manual release. you said put the meat back in the pot, when did you take it out and why? You may not be able to brown all of it at once. You may need to brown some of it in small batches. This recipe was absolutely delicious. I will definitely be making it again. MAN this was good. THANK YOU. Easy to use. Simple. Nice video. LOVE YOUR SITE!! How do you make this in a 3Qt instant pot? The directions would not change. I am not 100% sure if it would all fit though. Just make sure you do not fill above the max fill live. 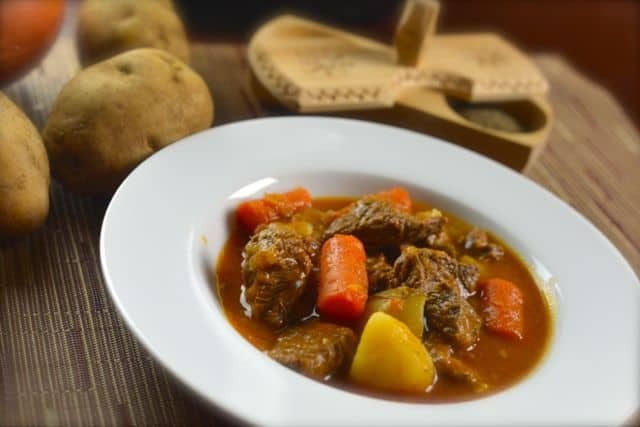 This is my go to recipe for IP Beef Stew. I add celery and mushrooms…and stir in some frozen peas and thicken with a little constarch slurry on sauté at the end. I have also substituted some of the liquid with 1/2 cup red wine. I cook veggies for 3 min with perfect results. I made this with Elk meat and added a bay leaf. It was delicious! Just made this recipe for my family and it was amazing. The only thing different was that I added chopped fresh garlic after the beef was seared. I just received my instant pot for Christmas and this was my first recipe to try. My family all enjoyed it. Very good stew. I made a few changes though. I coated the meat with flour, used V8 and dumped in veggies with meat. Cooked on high 35 minutes. Manual release 15 minutes. Inused russets and the potatoes were not mushy. Can I use frozen beef already cut into chunks without thawing first? I came here to ask same thing did you find out? The instant pot is such a lifesaver! Love this recipe. I’m loving my Instant Pot for quick dinners- this is a great recipe! I have already made this over 5 times and it was perfect every time. This is my got- recipe for Instant pot stew. I was wondering how the veggies didn’t overcook—genius recipe! I’ll be making this a lot this winter! I love the instant pot, and this is such a great hearty stew recipe.